These secrets are what the best moose hunters use and we want YOU to know them. Believe me if you do not know these tips, you are not seeing the most moose. If you use these hunting tips not only you will see more moose, you will get closer to them and quite possibly harvest the moose of a lifetime. Do you want to increase your chances of getting a moose this fall? I suggest you read about and put to practice these best tips for getting moose. We see a lot of other hunters out in areas where we hunt moose, the majority seem to just drive around, hoping that by some chance they might see a moose within a reasonable distance of the road. Unbelievably, they do not even get out of their vehicles! To increase your success rates you have to get out and look where the moose live… preferably away from human traffic. We have to admit though (sheepishly); we have done some road hunting and taken a few moose this way too. Actually road hunting is a good way to get familiar with a new area. The point is, if you get out of your truck and get away from the roads and people you are going to see more moose. Read on to find out how to apply some of our best moose hunting tips. Concentrate on one area. Use the wind to your advantage, and use a wind indicator to detect the direction from which the air is flowing. During the rut or breeding season, hunt near lakes and ponds. Preseason Scouting and Calling will definitely be to your advantage. Hunt during the moose rut… whenever possible. Late season moose hunting requires you to go deeper into the forest away from the openings. Be sure to carry a GPS or at the very least a compass for to ensure your safe return. 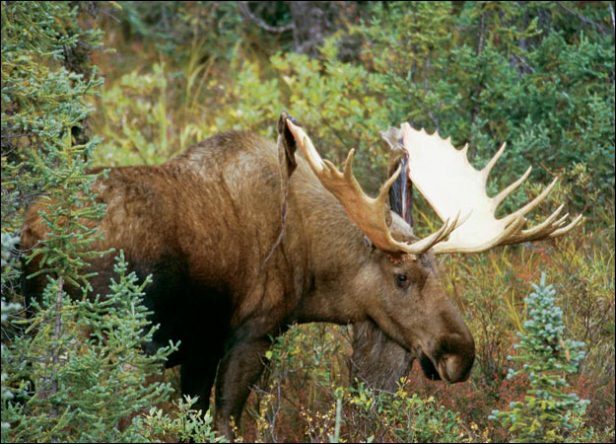 Identify and learn to hunt the prime moose habitat. The Moose Hunting Tips eBook – The Ultimate Guide to Moose Hunting can help you. Quite simply it’s the largest collection of moose hunting tips and techniques available in one place. We’ve run into more than one hunter over the years who mentioned the fact that they had to go to town for WiFi service to read up on hunting tips. Well no more. Download them, print them out or install them onto your electronic device. That way you can have them with you even in the field. 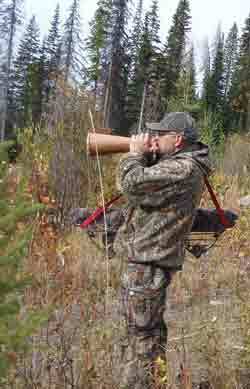 Use a Moose Call and learn how to use a call. Then put moose calling to the test. Use a Montana Moose Decoy. The cow moose decoy can be used to get the attention of a bull moose. Especially useful when you need to stalk a bull out in the open or when you have an incoming bull. Get the bull moose concentrating on the decoy and not you the shooter. Make use of a trail camera for moose hunting. Carry 30 feet of rope in your pack. This can be used as an aid when field dressing. Wear clothing that does not make any noise while you move. Fleece or wool is best. Also check out the entire line of Sitka Hunting Clothes. We have switched because the patterns make you invisible! Drink clean water… be sure the water you drink is free of beaver fever. As a moose hunter, it doesn’t matter if you are a novice or an expert, we all strive for the same result. Get close enough to a moose (bull, cow or calf) and make the shot. If we know enough it’s easier to close the distance, what if we don’t? How can we get just a few more ideas on closing the gap?